Senate President, Dr. Abubakar Bukola Saraki has urged the Senate Committee on Power, Steel Development and Metallurgy to conduct a public hearing into declining electricity generation in the country that currently stands at 3000 megawatts capacity. Also, the public hearing is expected to verify the claims and counter claims of non-remittance of revenues between the Nigeria Bulk Electricity Trading Company (NBET), Electricity Distribution Companies (Discos) and Generation Companies (Gencos) as well as uncover how the Central Bank of Nigeria (CBN) disbursed the N213 billion intervention fund to the power sector. Saraki who spoke at the weekend during a special stakeholders meeting to proffer solutions to the worsening electricity generation in the country said the public hearing should look at the role of the Bureau of Public Enterprises (BPE) which serves as Board members in the Discos and Gencos, thereby making it difficult for the BPE to effectively supervise and audit the electricity generation and distribution companies. He had in his opening comments lamented the poor electricity supply in Nigeria and the consequences of the negative development in the efforts to move Nigeria out of the present economic recession. He told the stakeholders in the power sector led by the Permanent Secretary of the Federal Ministry of Power, Works and Housing, Mr. Louis Edozien that the essence of the meeting was to proffer solutions to an imminent collapse of the electricity system in the country. Briefing the meeting, the Permanent Secretary, Edozien, lamented that power generation has gone down to 3000MW/H from a 7000MW/H generating capacity with a 12000MW/H connected load. Edozien also said there was poor and declining revenue collection capacity as the Discos are remitting about 45 per cent of collectable revenue instead of the performance agreement target of 65 per cent. He further cited low tariff and what he described as 'payment transparency and discipline' as some of the challenges facing electricity generation and distribution. In their contributions at the meeting, representatives of gas producers and suppliers traced their inability to supply adequate gas to the electricity generating companies to vandalization and the inability of the GENCOs to pay for the already supplied products, insisting that the terms of gas supply and payment is on the basis of 'willing sellers and buyers'. The gas producers and suppliers consisting mostly of SHELL Petroleum and TOTAL Petroleum complained of security challenges that usually result in the vandalization of their pipelines and hence their inability to meet demands in some cases. The meeting was shocked when s representative of NBET, Dr. Marilyn Amobi, who is the managing director and chief executive officer, revealed that the DISCOs can't account for most of the revenue remitted to it by consumers due to what she described as 'bad behaviour', an euphemism for corruption. She further said that revenue generated by NBET was better before the liberalization exercise when compared to post-liberalization period, blaming it on lack of proper accountability and supervision of the DISCOs by BPE and lack of proper auditing. Other stakeholders blamed the distribution companies for lack of compliance with the agreed terms on remitting generated revenues from consumers, manifesting in consumer discontent, payment default as well as unstructured and unserviced debts. 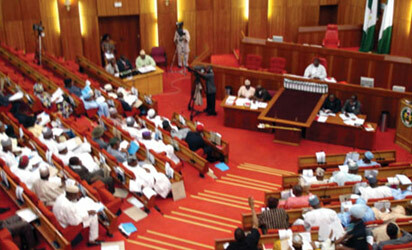 The complaint of lack of transparency in the remittance of revenues collected prompted the Senate President to direct that a public hearing be conducted by the Senate Committee on Power, Steel Development and Metallurgy to identify the problems and make recommendations on the way forward.